What is the Problem with Eurasian watermilfoil? Eurasian milfoil must be managed continuously to sustain the environmental and economic integrity of public and private waterbodies. Current methods of EWM control use physical, mechanical and chemical disruption processes that neither eradicate EWM nor provide long-term control. These methods are expensive, and at best, stop-gap measures. Due to their damaging effects on the environment, some are banned in certain states and provinces. 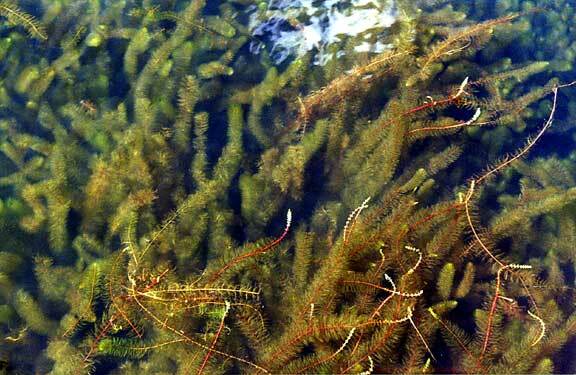 Eurasian watermilfoil (Myriophyllum spicatum) is an attractive plant with feathery underwater foliage. It was once commonly sold as an aquarium plant. Eurasian watermilfoil, hereafter called milfoil, originates from Europe and Asia, but was introduced to North America many years ago and is now found over much of the United States. This plant was introduced to the eastern United States at least as long ago as the 1940s, but it may have arrived as early as the late 1800s. 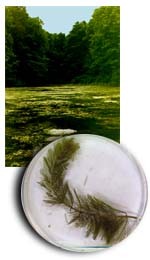 The first known herbarium specimen of milfoil in Washington was collected from Lake Meridian near Seattle in 1965. By the mid 1970s it was also found in Lake Washington. During this same time period milfoil became established in central British Columbia and traveled downstream to Lake Osoyoos and the Okanogan River in central Washington. Now milfoil is found in the Columbia, Okanogan, Snake, and Pend Oreille Rivers and in many nearby lakes. In western Washington, the distribution of milfoil closely follows the Interstate 5 corridor. It is very apparent that milfoil has been spread from lake to lake on boat trailers. Because it is widely distributed and difficult to control, milfoil is considered to be the most problematic plant in Washington. The introduction of milfoil can drastically alter a water body's ecology. 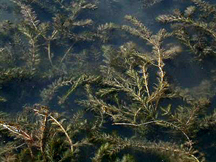 Milfoil forms very dense mats of vegetation on the surface of the water. These mats interfere with recreational activities such as swimming, fishing, water skiing, and boating. In eastern Washington milfoil interferes with power generation and irrigation by clogging water intakes. The sheer mass of plants can cause flooding and the stagnant mats can create good habitat for mosquitoes. Milfoil mats can rob oxygen from the water by preventing the wind from mixing the oxygenated surface waters to deeper water. The dense mats of vegetation can also increase the sedimentation rate by trapping sediments. Milfoil also starts spring growth sooner than native aquatic plants and can shade out these beneficial plants. When milfoil invades new territory, typically the species diversity of aquatic plants declines. While some species of waterfowl will eat milfoil, it is not considered to be a good food source. Milfoil reproduces extremely rapidly and can infest an entire lake within two years of introduction to the system. Although milfoil produces many seeds, we do not believe that these seeds are important for milfoil reproduction in Washington waters. However, milfoil is able to reproduce very successfully and rapidly through the formation of plant fragments. In the late summer and fall the plants become brittle and naturally break apart. These fragments will float to other areas, sink, and start new plants. Milfoil will also grow from fragments created by boaters or other disturbances during any time of year. A new plant can start from a tiny piece of a milfoil plant. This is why milfoil can so easily be transported from lake to lake on boat trailers or fishing gear. Once established in its new home, water currents may carry milfoil fragments and start new colonies within the same waterbody. The genus is easy to identify because all milfoils have feather-like leaves arranged in whorls around the stem. Identifying individual species is much more difficult and even the plant experts rely on DNA analysis to tell some species from each other. There are several native milfoil species in Washington and some species like northern milfoil (Myriophyllum sibericum) are commonly found in Washington lakes. In fact, for many years northern milfoil and Eurasian watermilfoil were classified as the same species. Currently botanists seem to be in agreement that the two are separate species, though often can look very similar. The milfoil leaflet to on the right is from a northern milfoil plant. The threadlike segments are very widely separated and there are few pairs per leaflet. The Eurasian watermilfoil leaflet (left side of the photo) has many pairs of closely-spaced segments. Note also that the shape of each leaflet is different. Unfortunately not all northern and Eurasian milfoil leaflets look so differently from each other. Sometimes these two species look very similar and when that happens it is best to rely on DNA or pigment analysis for positive identification. Count the pairs of leaflets. Eurasian watermilfoil usually has twelve or more pairs on each leaf. Eurasian watermilfoil leaves tend to collapse around the stem when removed from the water. Other milfoil species have thicker stems and are usually more robust. The mature leaves are typically arranged in whorls of four around the stem. Since its accidental introduction to US waterways in the 1940s, Eurasian watermilfoil (EWM) has spread across North America to more than 45 states and much of Canada. Once established, this rapidly spreading freshwater weed out competes most native plants and interferes with recreational activities, wildlife habitat, and facilities having water uptake systems. often results in a monoculture of EWM. can result in an unbalanced fishery. Eagle Landing lake residents have experienced a increasing problem with a non-native invasive aquatic species of plant called Eurasian Water Milfoil (Myriophyllum spicatum L.) . This plant forms thick mats of weeds which entangle boat props and shades out other native plants. Eurasian Water Milfoil is usually introduced into a lake from plant matter not properly cleaned off boats coming from other infested lakes. As little as 1/4" of stem will grow a new plant. The plants go dormant in the fall, and regrow each spring. A contact herbicide which is non-toxic to fish and wildlife has been repeatedly applied, but this herbicide is short acting and requires respraying several times a season making it expensive to apply. Various other means of eradication have been considered. After much research it was decided not to use sterlized grass carp because milfoil is the least favored plant of these fish. The carp will eat all the other lake plants before eating the milfoil. Additionally, a representative from Texas A&M University states that carp can undermine the stability of an earthen dam by pulling out vegetation by the roots. Harvesting by a machine is ineffective and too expensive. One lake resident proposed trying a natural solution in the form of a specific weevil. The Eurasian Water Milfoil Weevil (E. leconlei), native to the US, feeds upon Eurasian Water Milfoil exclusively. The 1/8" weevils bore into the stems, deposit their eggs, and the larva riddle the plants with holes interrupting the plants nourishment transport system which causes the plant to wither and die. The weevils do not bite, sting, swim, or fly. They simply crawl from one plant to another. Weevil eyesite is excellent. When a fish is spotted they quickly crawl around to the backside of the stem to hide, much like a squirrel does on a tree. A study done in New York for the Lake Boneaparte Conservation Club, where there was a large blue gill population in the lake showed that within a given sample of 90 fish there were less than 2% of weevils in the stomachs of the fish. There were also sprigs of milfoil in the fish stomach contents which could indicate the weevils were accidently injested along with the plant. It was concluded the weevils are not a major food source for fish. Once the weevils have the milfoil under control in a lake, usually between 3-5 years, the weevil population dwindles to a count that is proporationate to the remaining milfoil. The weevils will not remove all the milfoil but they will keep it under control and eliminate the need to spray a herbicide for milfoil. The adults overwinter in the lake mud. The life cycle of adult weevils is about 2-3 years. 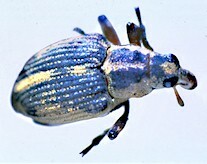 EnviroScience, Inc.(www.enviroscienceinc.com), an environmental company from Ohio, has been stocking northern lakes with weevils with much success for 20 years, under their Midfoil Project. When contacted, Marty Hilovosky, President, agreed to stock a test area in Eagle Landing to see if the weevils would survive in the warmer waters of the south. He mentioned that the Army Corp of Engineers has 7 test ponds near Dallas where they have been monitoring the weevils for the past 8 years. It was formerly thought that the weevils needed cold waters to overwinter, but lately native weevils have been found near San Francisco, CA, where the water does not freeze in the winter, so it is hopeful they will thrive here. On June 18, 2008, Marty Hilovosky personally brought 3800 weevil eggs and larvae to Eagle Landing for planting. A protected site was chosen at the far north end of the lake in a cove that has several underground streams feeding the lake and a large mat of milfoil. He carefully planted the eggs and larvae into the Eagle Landing milfoil by tying bunches of dying milfoil stems containing the weevil eggs and larvae onto the lake milfoil. He then placed an orange marker showing the seeded location. He said the eggs will hatch in about 3 weeks. Since the weevils reproduce a generation about every 25 days he expects 5 generations to grow during this season. One resident will monitor the results and report to him. He will return at the end of the year for an observation, and will bring additional weevils in the spring of 2009 to add to the existing weevil population. Since the weevils are sensitive to herbicides and need healthy milfoil to feed upon, and time to build up a sustainable population, there will be no spraying in the north end of the lake for several seasons. The south end of the lake will receive a standard treatment as needed. Over the past eight years, EnviroScience, Inc. has been working with Middlebury College (VT) to make MiddFoil® available to the general public. MiddFoil uses an aquatic beetle native to Canada and the northern US to combat the spread of Eurasian watermilfoil, an invasive aquatic weed that has spread like wildfire across North America. Based on eight years of intensive field application and more than 12 years of university research, MiddFoil has proven itself to be the only long-term, environmentally-friendly alternative to herbicides and mechanical harvesting for large scale infestations. For more information on Eurasian watermilfoil control using the MiddFoil Process, please follow the links to the left. Please see the Related News section below for information on how to get your copy of EnviroScience's recently completed MiddFoil DVD. You can watch a preview of the DVD below. If you have FLASH installed on your computer, simply hit the PLAY button..